A 33-year old single lady, Morenikeji Oke has been arrested for allegedly battering a housewife, Abiola Akubor after she had warned her to forget her husband because he belonged to her. The incident happened at Muyili Ashode Street in the Pipeline area of Ejigbo, Lagos where Oke resided and ran a drinking joint. Sources reports that Mrs. Akubor had insisted on having her husband, Sadiq back as she had two children for him. She reportedly went to Oke’s house in search of Sadiq around 10pm in the night but met the shock of her life. She was brutally attacked and injured on her left eye. 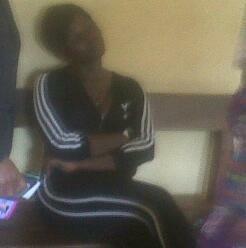 Even her sister who followed her to Oke’s house was not spared. Sources scooped that Akubor and her husband, Sadiq had been living together peacefully and had children until he met the single lady, Oke. His behaviours changed thereafter and he shifted focus to Oke. He was said to have been spending his time and money on Oke which his wife attempted to stop but was brutally attacked by the suspect.